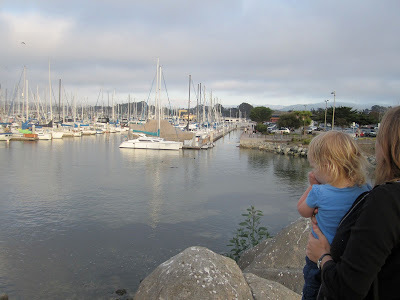 Once we decided that we were going to do a California road trip for our vacation this year, I knew that we had to go to Monterey. I wanted to see the aquarium- I'd been through Monterey on my way home from a wedding in San Francisco in graduate school, but hadn't gone to the aquarium. 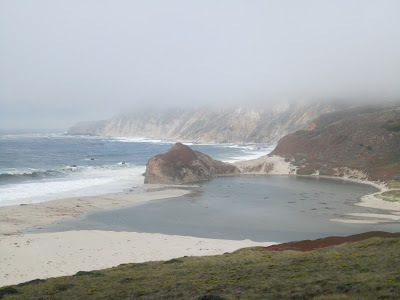 And I wanted to show my husband the famous coastal drive south from Monterey. We drove into Monterey at sunset, which was a good two hours later than I'd hoped. 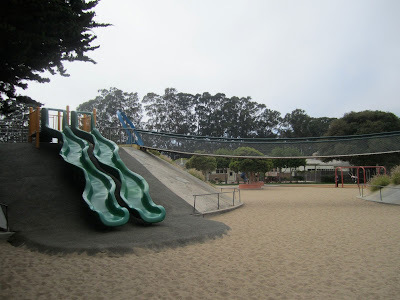 But we'd decided to stop for a playground break and afternoon snack in San Jose, which had taken longer than expected. Then we hit some traffic leaving San Jose... so the sun was setting as we drove past the marina and under the tunnel into the touristy section of Monterey. It was a beautiful sunset, and my husband still regrets that we didn't just stop and enjoy it. But we wanted to get to our hotel, which we thought was close, and get to dinner. 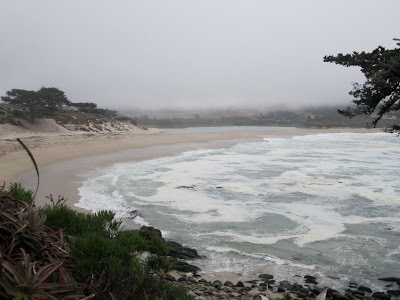 It turns out that our hotel was further than we thought- it was in Pacific Grove, not Monterey proper. We were led astray by a map in our guidebook. The hotel was nice, but I was bummed by its location and the fact that the suite I had carefully checked would be two rooms was not in fact two rooms- there was no door between the bedroom and living room. The lack of door meant that we ended up hanging out in the (really quite large) bathroom drinking beers after our kids were asleep. But I'm getting ahead of myself. By the time we found the hotel, got checked in, got changed into some warmer clothes, and got back to the "main drag", it was quite late for dinner. We didn't look around much, and just went into the first likely looking place, The Loose Noodle. This was a much higher class of restaurant than we usually go to with the girls, but it worked out OK. In fact, it would have been awesome if we could have received out food as we sat down- our only complaint was that Petunia lost interest and decided she wanted to walk around, so we had to resort to tag team dining: one adult ate while the other walked around outside with her. But the staff were very welcoming of us, and Pumpkin really liked her tortellini. After a few bites, she looked at me with wide eyes and said "Mommy! These are even better than our home ones!" She was right, but to be fair, our home ones are just mass produced store bought tortellini from the refrigerator section of our grocery store. We walked around Cannery Row a little bit after dinner, but soon headed back to the hotel to get the kids to bed and rest up for our big day at the aquarium. 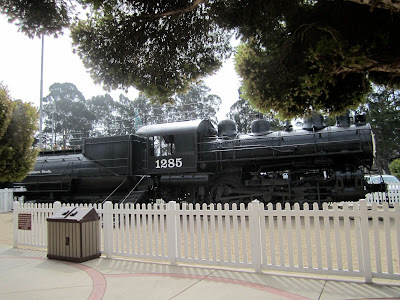 We stayed until lunch time, then headed to the Cannery Row Brewing Company for lunch. It was your standard brew pub fare with adequate but not exciting beers- but Hubby was impressed by his BLAT (Bacon, Lettuce, Avacado, and Tomato sandwich for those who don't know) and the fact that they gave him extra bacon on the side, so we had no complaints. After nap, we headed back to the aquarium for some more exploring. Then, we went over to the marina and pier, hoping to catch a sunset as good as the one we'd glimpsed on the way into town the day before. We were disappointed- but still had a good time strolling around. We had dinner on that side of town- it was another tag team affair, as Petunia discovered the joys of playing with newspaper boxes. 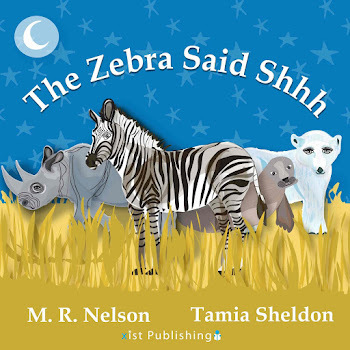 There was a row of them outside the restaurant, and once she discovered those, there was no way we could entice her back to the table. This is one of the many things about our vacation that was annoying at the time, but is funny- charming, even- in retrospect! The next day, we walked to the lighthouse near our hotel: the Point Pinos Lighthouse, the oldest continuously operated lighthouse on the West coast. 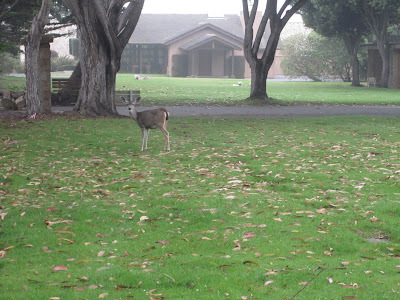 It wasn't open for visitors, but the trip was not a waste, because on our way there (through the cemetery next to our hotel), we saw a deer. This was exciting for both girls, and apparently not that unusual for the deer, who didn't seem concerned by our presence at all. There are also some great climbing toys, that long bouncy bridge you can see in the picture above, a rock wall, and a real train engine that you can climb on. 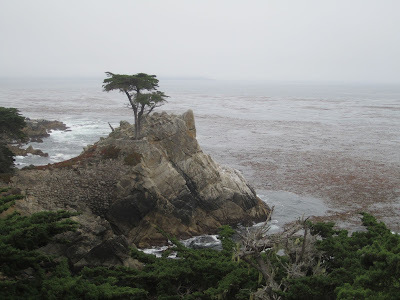 We pried the kids away in time for a quick lunch, and then headed south along the coast road, detouring first through Carmel-by-the-Sea, which is as picturesque as you've heard. Petunia was already asleep, so Hubby and I took turns checking out the beach at the one stop we made in town. It was a nice beach. It was fairly foggy, so our drive down the coast road was less spectacular than I'd hoped. Hubby was impressed with the engineering on the bridges, but not so impressed with the scenery, which he pointed out wasn't all that different from the scenery near Wellington or in the Marlborough sound in New Zealand. Spoil sport. Maybe if we go back sometime and get some better weather he'll be more impressed, but I won't count on it. He has a valid point about the scenery in New Zealand. So here's a helpful hint: don't try to impress New Zealanders with coastal scenery. It is unlikely to work. Unless you have rows of palm trees. They seem to think those are cool, much like I thought the giant ferns in New Zealand were cool. 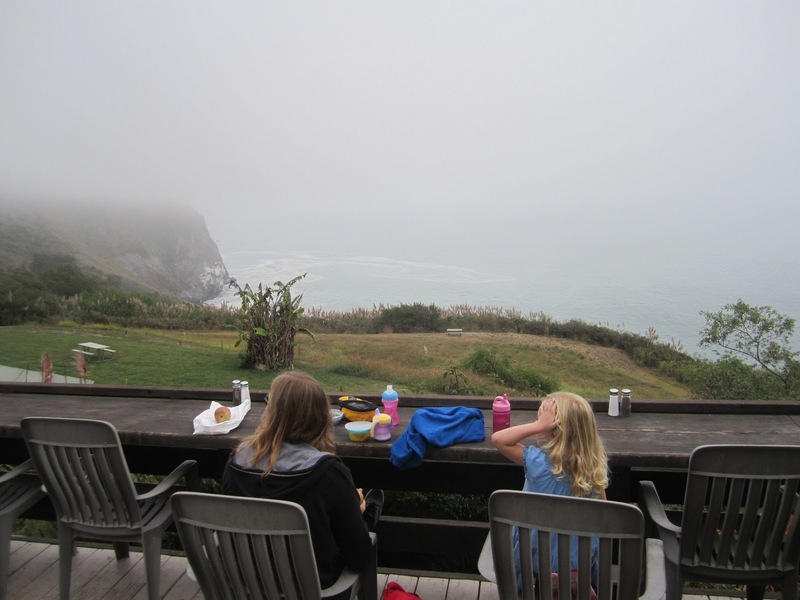 Hubby did allow that our snack stop at the Lucia Lodge was probably the most scenic snack ever, though, even with the fog. And the seals at Point Piedras Blancas were pretty cool. The seals were also a good warm up for our next stop, Morro Bay, which provided more seal sighting opportunities. More on that later! "This is one of the many things about our vacation that was annoying at the time, but is funny- charming, even- in retrospect!" This made me laugh. 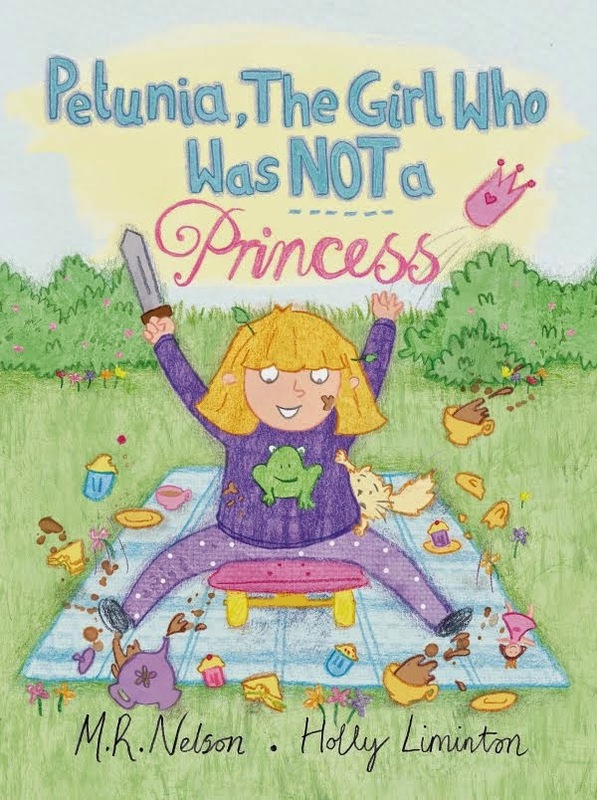 I have a large category of events, many but not all vacation events, that fall in the category, "This is no fun now, but it will be great in the retelling!" Certainly having kids (little or teen/young adult, I've done both, nothing between 4 & 13 yet, though) helps if you want to expand these experiences; budget and/or "roughing it" (camping, etc.) travel does too. My word verification is "cargust" which is kind of funny for a trip about driving the CA coast. We were in Monterey for my grandma's funeral the other year. Very nice. I spent a lot of time in Monterey before grad school when I was doing research on sea otter nutrition, of all things. That led me to spend many hours in tide pools there, and that is still my favorite thing to do on that part of the coast. 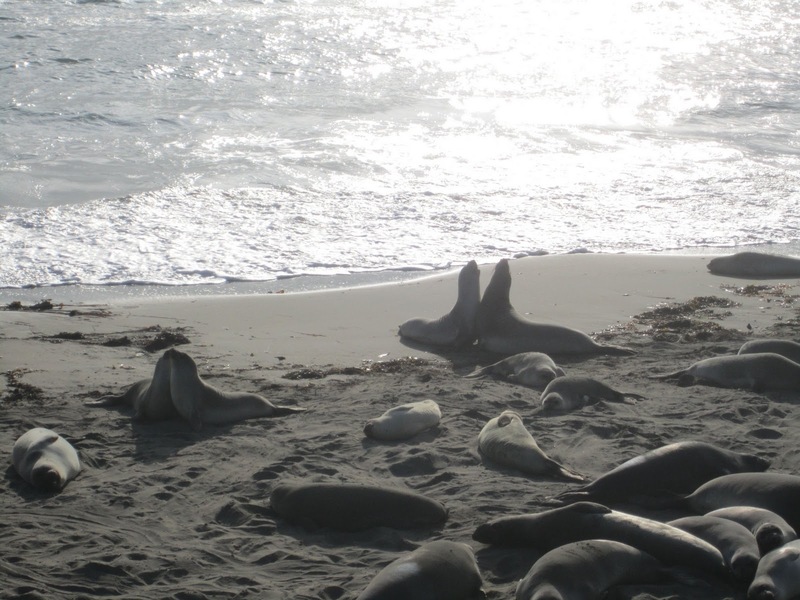 I also love the seals at Piedras Blancas. Go in January and see them pupping! 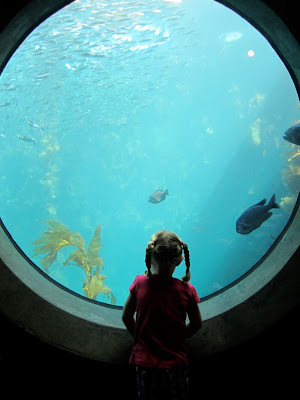 That's a good biology lesson:) I think Monterey itself is a little overly touristy, but I also love the aquarium. I'm really enjoying your CA trip posts! They make me think of all the kid-friendly things we get to explore when we go back with ours. I'm glad you're enjoying these posts! I'm mostly writing them so that I'll remember our trip, but it is nice to know at least one other person likes reading them.